Caltech president Thomas Rosenbaum, Sonja and William Davidow Presidential Chair and professor of physics, led the midmorning press conference, which included U.S. Representative Adam Schiff; U.S. Representative Judy Chu; Tom Heaton, professor of engineering seismology; Lucy Jones, research associate in geophysics at Caltech and founder of the Dr. Lucy Jones Center for Science and Society; Doug Given, earthquake early warning coordinator for the United States Geological Survey (USGS); and Ryan Arba, seismic hazards branch chief at the California Office of Emergency Services. Earthquake early warning systems like ShakeAlert consist of a network of sensors near faults that transmit signals to data-processing centers when shaking occurs. These data-processing centers use algorithms to rapidly determine the earthquake’s location, magnitude, and the fault rupture length—determining the intensity of an earthquake and sending out an alert that can provide seconds or even minutes of warning. Paired with automated responses that will shut off gas before shaking starts, ShakeAlert could be instrumental in preventing the fires that typically damage cities after a major earthquake, Jones said. Earthquake early warning systems do not predict earthquakes before they happen. Rather, they transmit a heads-up that an earthquake is happening; a heads-up that can arrive ahead of the seismic waves generated in the quake, potentially providing crucial time to allow individuals to take cover and for infrastructure to prepare for the quake (for example, for trains to halt operation). These warnings operate on the principle that seismic waves travel at just a few miles per second, but messages can be transmitted almost instantly. During an earthquake, several types of seismic waves radiate out from the quake’s epicenter, including compressional waves (or P-waves), transverse waves (or S-waves), and surface waves. The weak P-waves move faster than the damaging S-waves and surface waves. With an earthquake early warning system in place, those P-waves will trigger sensors that can send out a warning ahead of the arrival of the S-waves and surface waves. Though only half of the sensor network that ShakeAlert will need has been built out so far—primarily around major metropolitan areas—the state of California and the federal government have allocated funding that should allow the rest of California’s portion of the network to be constructed over the next two years, Given said. In addition, an upgrade to the software that processes data from the sensor networks was deployed on September 28. This new software should reduce the number of mistakes and missed alerts, making ShakeAlert more reliable, Given said. A key step now is for companies and institutions to help find ways to take advantage of these alerts to save lives, he said. 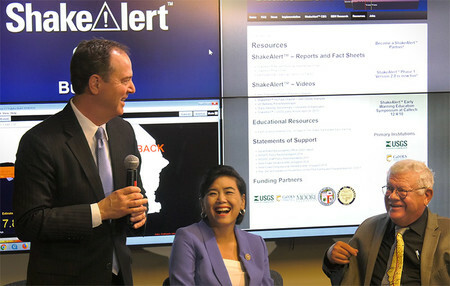 Future iterations of the system will be able to send warnings to cell phones as well, Schiff said. Such alerts will need to be rolled out with public education to explain to individuals what to do when they receive such alerts—not to panic—and know that there could be false alarms. For Heaton, one of the fathers of ShakeAlert and a scientist who has been interested in earthquake early warning since 1979, this is a day that was a long time in coming. “In those days, I could see that we could technically do it. But what I didn’t really understand was what was involved to get 40 million people on the West Coast to get together to try and make this system a reality. What it really takes is leadership to do that,” Heaton said. Earthquake early warning systems already exist in Mexico and Japan, which have experienced recent and devastating earthquakes. But it has been difficult to find the political will to spend millions of dollars developing a system for the U.S. West Coast, which is long overdue for a serious earthquake. ShakeAlert has been in development since 2006. In 2011, Caltech, along with UC Berkeley and the University of Washington received $6 million from the Gordon and Betty Moore Foundation for the research and development of the system; and in 2015, the USGS announced approximately $4 million in awards to Caltech, UC Berkeley, the University of Washington, and the University of Oregon for ShakeAlert’s expansion and improvement. Currently, ShakeAlert’s infrastructures consist of the California Integrated Seismic Network (400 ground-motion sensors operated by Caltech in partnership with UC Berkeley, the USGS, and the State of California), and the Pacific Northwest Seismic Network (a similar regional network operated by the USGS, University of Washington, and the University of Oregon). Over the past few years, ShakeAlert has detected thousands of earthquakes, including two that caused damage. It began sending alerts within four seconds of the beginning of the magnitude 5.1 La Habra earthquake in 2014, and gave users in Berkeley five seconds of warning before seismological waves arrived during the magnitude 6.0 South Napa earthquake, also in 2014. Beta-test users received these alerts as a pop-up on their computers; the pop-up displayed a map of the affected region as well as the amount of time until shaking would begin, the estimated magnitude of the quake, and other data.